AirCuishion Suspension isolates the chassis from harsh inputs due to uneven terrain for smooth ride. 8370RT Tractor – Driven by the need for more. 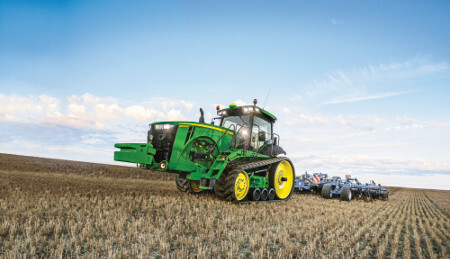 Power to do more - John Deere 8R and 8RT Series Tractors. High power density coupled with a high horsepower rating with up to 450 max engine hp with IPM) gives you speed and efficiency. Extensive hitch and PTO options also make the 8R Series tractors extremely versatile.Extensive hitch and PTO options also make the 8R Series tractors extremely versatile. Less power losses result in a higher efficiency and more pulling capacity. That´s why the superior efficiency of John Deere 8R Series tractors deliver up to 94% overal tractor efficiency*. 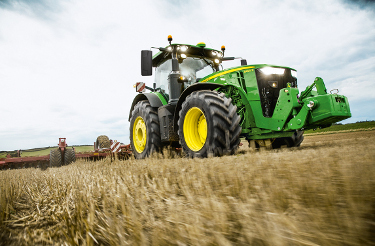 The impressive efficiency of John Deere 8R and 8RT Tractors deliver up to 94 percent overall tractor efficiency. The compact cooling package that doesn’t compromise on cooling surface has an excellent airflow with no restrictions. The 9.0L engines offer superior torque and fuel economy under all conditions. You can count on the high efficiency of e23™ PowerShift™ transmission and AutoPowr™ transmission. And finally, the axle design and wide tyres up to 2.15 m (7.05 ft) deliver more power to the ground. 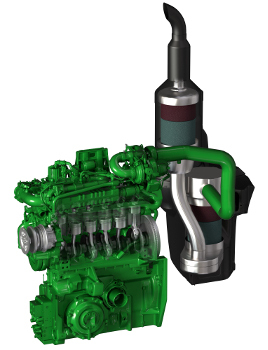 John Deere PowerTech™ PSS 9.0L turbocharged engines meet the latest Stage V emission regulations with integrated emissions control while reducing operating costs and boosting performance. The 9.0L engine in the 8R Series Tractors delivers a torque rise of up to 40 percent and an outstanding power bulge of up to 10 percent. Peak torque is available at the ideal engine rpm within a wide constant power range to ensure tremendous pulling performance. Diesel exhaust fluid (DEF) mixes with engine exhaust gases in the catalyst to reduce further nitrogen oxides (NOx). The industry-leading DEF consumption is just 2 to 3 percent of diesel use. Precise amounts of cooled exhaust gases are mixed with incoming fresh air, lowering combustion temperatures to lower NOx output while further reducing emissions. The series turbochargers deliver more low-speed torque and engine responsiveness to meet varying load requirements. The diesel oxidation catalyst (DOC) and diesel particulate filter (DPF) remove particles down to 2.5 μm. The top of the range 8400R has an optimized piston design which enables the achievement of higher power levels without any impact on the durability of the proven 9.0L engines. In addition, you gain higher fuel efficiency with better heat rejection of the pistons. Benefit from low total fluid consumption and very fast engine response time at load changes thanks to the high-pressure fuel system. Vari-Cool precisely controls the speed of the fan in relation to the cooling requirements to maximise the efficiency of the engine and to save fuel. The 8R Series Tractors offer a range of transmission options to tackle the challenges of your operations: the AutoPowr™ infinitely variable transmission (IVT™), the mechanical 16-speed PowerShift™ transmission, and the e23™ PowerShift transmission. There are four different modes available to operate the AutoPowr transmission: Full Auto, Custom, Manual, and Pedal mode, which enables you to control ground speed separately from the engine. With the AutoClutch feature, you can simply depress both brakes, and the transmission ratios down to a stop from any ground speed without using the clutch pedal. AutoPowr lets you shift smoothly from start-up to maximum speed with a single lever and absolutely no clutching. Just select a specific speed and AutoPowr keeps it steady by automatically responding to changing load conditions. AutoPowr lets you smoothly start-up, achieving maximum speed with absolutely no clutching. Top speed is 40 km/h (24.9 mph) at 1,360 rpm and 50 km/h (31.1 mph) at 1,630 rpm for low transport cost. AutoPowr delivers stepless and continuous power across an infinitely variable range of speeds controlled by a single lever. 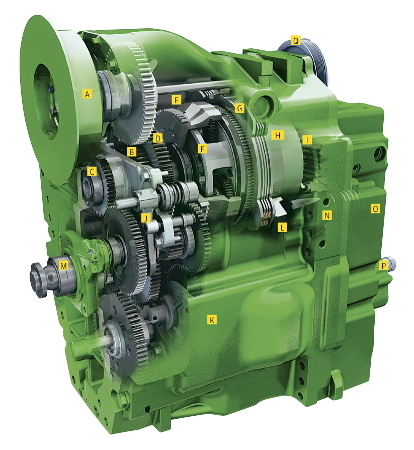 The exclusive John Deere-built AutoPowr transmission with four ranges always ensures a maximum mechanical power transfer in all speed ranges. With 55 percent to 100 percent of mechanical power flow, the AutoPowr transmission boosts the efficiency of the tractor and gets more power to the ground. The reduced hydraulic part has other positive effects: a lower oil cooling requirement, a higher mechanical percentage of power transfer and, with that, improved fuel efficiency. 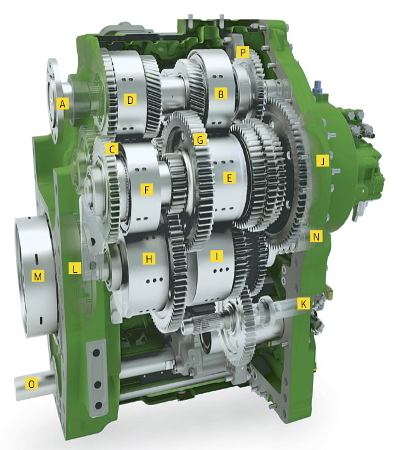 We offer you the flexibility to choose the right transmission to fit your needs. The e23 transmission is engineered to deliver maximum power transfer for arable farming with road transport. Alternatively, choose the full PowerShift transmission (16F/5R) or the intuitive functionality of the AutoPowr IVT. The e23 transmission combines all the benefits of a mechanical transmission with the ease of use of an AutoPowr. Ten fully powershiftable gears are available in the main working range (5 to 16 km/h [3.1 to 9.9 mph]) for maximum pulling power in the field at the right rpm. With the AutoClutch feature, you can simply depress both brakes, and the transmission ratios down to a stop from any ground speed. Efficiency Manager allows the operator to preset the working speed and helps to save fuel by keeping the engine rpm at an optimum speed by automatically shifting up and throttling back. Ten gears in the main working range from 5 to 16 km/h (3.1 to 9.9 mph) provide the ideal gear for the most demanding pulling application, resulting in high field performance. The 16-speed PowerShift transmission is available for the smaller models up to the 8320R with 16 forward and 5 reverse speeds. Better traction means increased productivity. 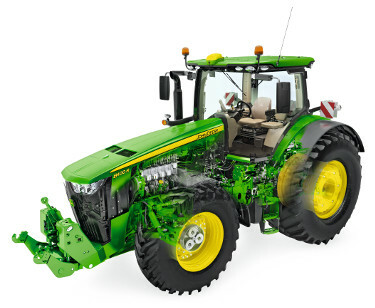 The structural chassis of the 8R Series has been designed for unprecedented power density. With a robust chassis, the ILS providing extra drawbar pull, and a long wheelbase for additional traction and stability, John Deere 8R Tractors allow you to do more, even in tough conditions. ILS is an automatically adjustable, independent front-axle suspension and is designed to maximise power transfer to the ground for higher productivity, even in very rough terrain. 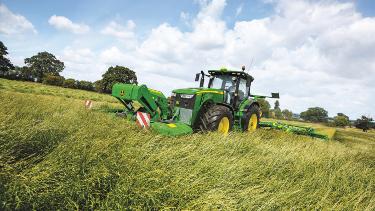 John Deere offers a variety of tyre options for a wide range of field and transport applications. Select 2.15-m (7.05-ft) diameter rear tyres for better power transfer and higher ground clearance. You will also get sufficient traction with less ballast, reducing soil compaction and increasing the payload. 8R Series Tractors are designed with a perfect 55:45 weight split. Wide ballasting options are available if required and can be easily installed and removed. John Deere 8RT Series Track Tractors give you a wide range of operating speeds with the AutoPowr™ transmission or e23™ transmission and consistent performance at the lower end of the range. A variety of track sizes is available according to application requirements. All 8RT Tractors will come with an updated design steering system with in-cab steering sensitivity adjustment. These updates greatly improve steering response and steering authority. The steering pump and loop-override circuit give the John Deere 8RT the ability to turn under load like no other two-track tractor in the industry - in the field or on the road. Drive wheels are moulded with a chevron tread pattern. This pattern helps to improve and maintain friction force between the drive wheel and track belt in a wide variety of applications. 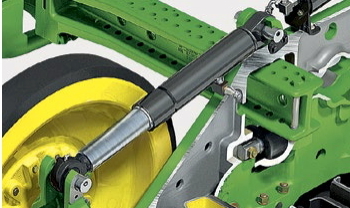 The inline tension arm and alignment mechanism built into John Deere 8RT Tractors virtually eliminate the risk of belt derailing. 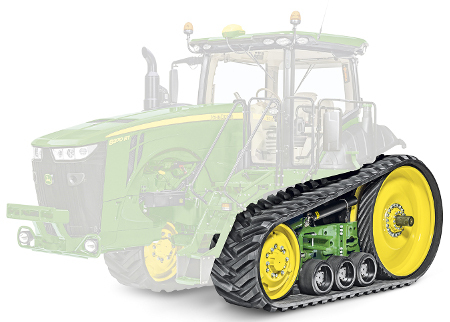 8RT Series Track Tractors feature inboard planetary final drives to allow for adjustable tread widths. 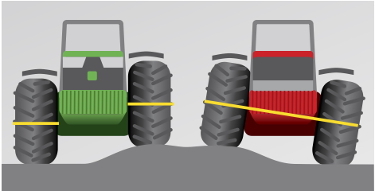 Minimal time and no additional spacers are required when adjusting tread width within a given axle configuration. Your comfort is our priority. The impressive AirCushion™ suspension system on 8RT Series Tractors isolates the cab from the bumps of uneven terrain and provides the smoothest of rides for the operator both in the field and at transport speeds. 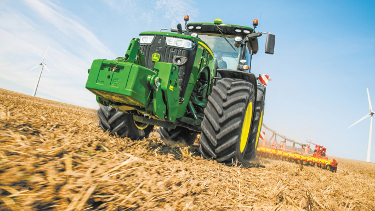 Together with the updated cab suspension, the driver gets the best possible comfort on a two-track tractor. The AirCushion suspension isolates the chassis from harsh inputs due to uneven terrain. The entire system is fully automatic and requires no operator adjustment. This system also allows the vehicle to travel much faster over rough ground while maintaining operator comfort. 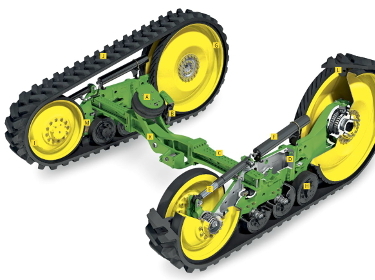 For maximum reliability and traction, the 8RT undercarriage system uses large drive wheels and mid-rollers. The four-post cab suspension of the 8RT has four coil-over shocks tuned for optimum ride performance in field and transport conditions with 50 mm to 100 mm (2 in. to 3.9 in.) of travel range. It automatically adjusts to uneven terrain and requires no programming for road or field applications. The lower parallel links provide pitch stability and fore/aft position for the cab. The combination of the upper torsion bar links and lower parallel links provide a near vertical motion of the cab. This provides an ideal ride for the operator. John Deere offers the Camso® Durabuilt® 4500 and 6500 Series rubber track options exclusively in a range starting from 400-mm (16-in.) up to 760-mm (30-in) widths. 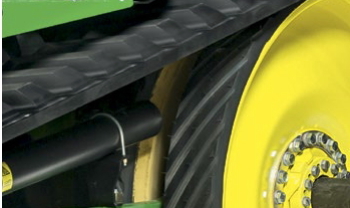 The Durabuilt 6500 Series track is the most durable for 8RT Tractors. It provides improved rubber and more woven steel threads for extended tread and guide-lug life in severe applications. Camso is a trademark of Artic Investments S.A. Durabuilt is a trademark of Camso Inc. When you climb into the CommandView™ III cab, the first thing you notice is the space you have and the premium fit and finish quality. Thanks to the laminated glass and front sound barrier, you will enjoy less noise intrusion. The exceptionally low 69 dB(A) makes for a more relaxed day (8R Tractors). Visibility is also better than ever, especially when you rotate the seat 40 degrees for a nearly unobstructed view of your attachment. 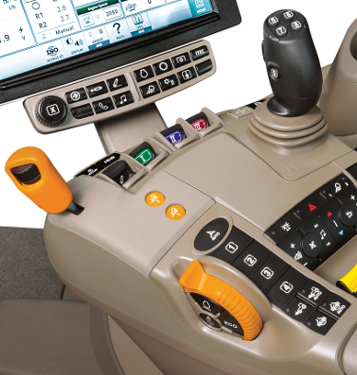 The key tractor functions for the transmission and engine controls and for the power take-off (PTO) and selective control valve (SCV) operations are ergonomically placed on the CommandARM™ console. Visibility and comfort is better than ever, especially when you rotate the seat 40 degrees for a nearly unobstructed view of your attachments. You will feel the difference after a day of work. 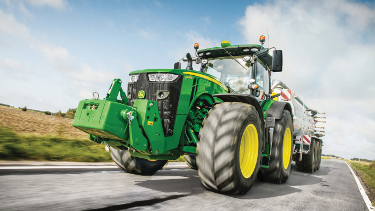 Dynamic road wheel offset control keeps your tractor on track with minimal effort. It automatically adjusts the road wheel angle. Variable ratio steering provides light, agile steering at slower speeds and heavier steering for higher speeds. ACS automatically reduces to 3.5 lock-to-lock steering wheel turns for quick headland manoeuvres and lowers hand wheel motion to 75 percent. Full electronic steering control removes all the drawbacks of a conventional steering column-to-wheel setup. It reduces vibration significantly and eliminates free play completely. 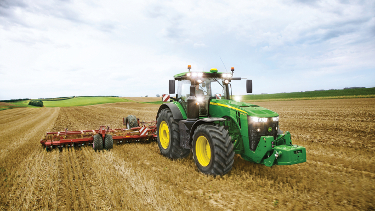 The 8R Series makes sophisticated agricultural technology easy to operate. Everything is within easy reach on the CommandARM control stack and clearly viewable on the Generation 4 CommandCenter™ display. Navigation is made easy with logical menus and a comprehensive shortcut bar. With Quick Line, you can now record an AB line with just one button press. Choose between the 21.3-cm (8.4-in.) 4200 CommandCenter Display or the 25.4-cm (10-in.) 4600 CommandCenter Display. The Generation 4 CommandCenter display is AEF ISOBUS compliant. You can control your ISOBUS-ready implement through the Universal Terminal (UT) and run automatic section control through Task Controller (TC-SC, TC-BAS), depending on the AEF certification level of the implement. Task Controller Section Control (TC-SC) allows individual control of up to 255 sections, while TC-BAS enables documentation of totals in ISOXML data format. TC-GEO adds the capability for geo-referenced ISOXML documentation. 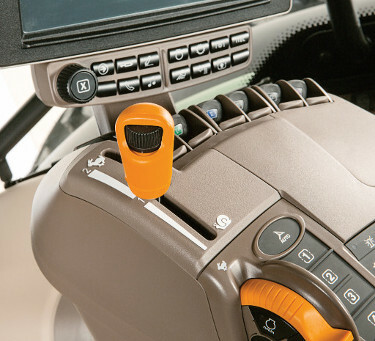 AUX-N provides universal compatibility to the tractor joystick. The CommandCenter display functions just like a tablet with touchscreens; navigating through the options is simplified via menus, shortcuts, and with context-sensitive help. And you can run our field proven mainstream AMS solutions. On the CommandARM console, the SCV levers and couplers in the back of the tractor are colour-coded to simplify recognition. For convenience, all SCVs can be operated via easy-to-reach SCV control levers. All SCV levers can be easily reconfigured and stored individually for each application with the Settings Manager. 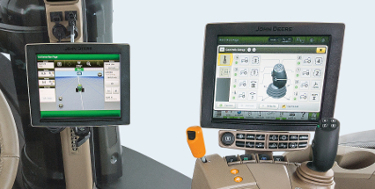 Both Gen4 CommandCenter displays are connected to the Operations Center on MyJohnDeere.com through Wireless Data Transfer. It not only backs up your display setup data, but also adds additional convenience and benefits to AutoTrac while it automates infield documentation. 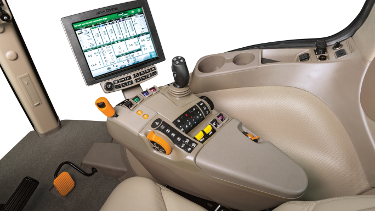 You or your John Deere dealer can remotely log on to the Generation 4 CommandCenter display to assist operators with machine and ISOBUS implement setup and operation. In addition, on-screen help files enable operators to get familiar with all functions. The new Gen 4 Extended Monitor doubles the available screen area so you can monitor more functions at once and have direct access to make adjustments when needed. 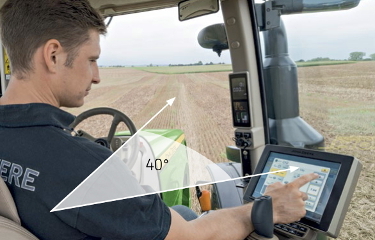 For example, you can view vehicle control functions on the primary display and Precision Ag applications on the Extended Monitor. All the daily tasks an operator needs to manage during his job require different functions and levers to be operated at the same time. With the new generation of 8R Series Tractors, almost everything can be reconfigured on the CommandARM controls to meet the desires and requirements of the operator and his application. Instead of SCV 1, you would like to operate the front hitch next to the rear hitch lever – no problem! 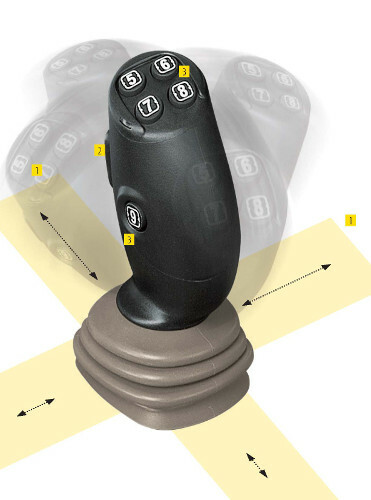 Entering the control setup enables you to reconfigure all hydraulic functions on the joystick or on the SCV levers. For even more operator comfort, ISOBUS-driven implements can be operated via the push buttons on the joystick. For the ultimate level of reconfigurability, easily set functions like loader auxiliaries, AutoTrac activation, iTEC™ control sequences, and gear-shifting to the joystick push buttons or SCVs, whereas the SCVs and front and rear hitches can be set to the axles of the joystick. And the best part is you can set up and recall all your settings individually per implement in the Settings Manager. 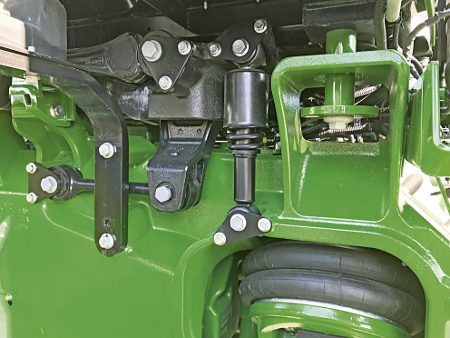 John Deere Independent-Link Suspension (ILS™) system brings enormous gains to your productivity in the field and on the road. It increases transport and field productivity with superior stability and higher comfort. The John Deere ActiveSeat™ equipment or the cab suspension allows the operator to increase productivity and decrease the effects of fatigue. Advanced independent axle suspension, especially in combination with the advanced cab suspension or ActiveSeat, ensures exceptional driving comfort. This innovative design incorporates proven suspension design with mechanical front-wheel drive (MFWD) axle components that use state-of-the-art technology specifically for heavy equipment usage. The ILS system gets more power to the ground because the front tyres maintain ground contact pressure. This improves field and transport ride plus increases ballasting flexibility and drastically decreases the tendency to power hop. 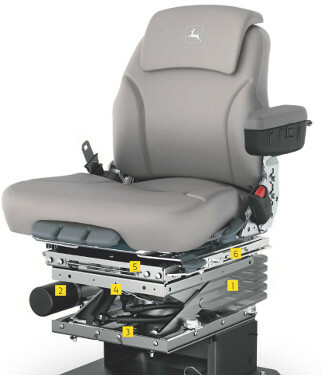 The ActiveSeat utilises electrohydraulic technology in combination with air suspension. ActiveSeat isolates up to 90 percent of vertical movements and provides the operator with enhanced ride-quality over standard air suspension seats. The advanced cab suspension system isolates the cab from shocks to provide maximum comfort and ride quality for the operator, both in the field and in transport. It allows the operator to increase productivity and decrease the effects of fatigue. In addition to having a smoother ride, the cab is more isolated against noise and vibrations from the engine, transmission, and chassis compared to the base equipment cab. The LED option provides 40 percent greater coverage to the side view and 10 percent greater rearview coverage compared to standard halogen lighting. 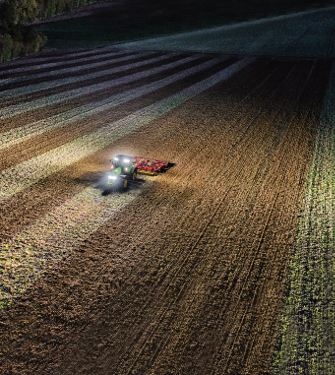 The LED lighting on John Deere 8R/8RT Series Tractors provides high-quality white illumination for easier visibility and contrast. There are 22 LED lights providing 360-degree visibility. The result: night becomes like day, putting less strain on the eyes. LEDs are virtually indestructible, with a minimum 10,000-hour life expectancy and high resistance to vibration and extreme temperature. For your convenience, all lighting is easily controlled via the CommandCenter™ display. The hydraulics in 8R/8RT Series Tractors give you exactly the power you need at the precise moment you need it. 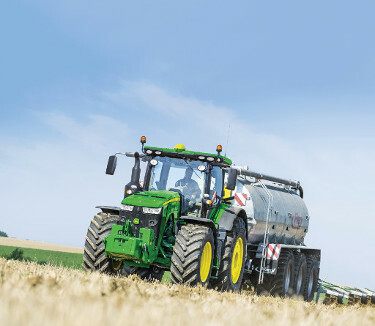 With up to six selective control valves (SCVs) at the rear, up to two at the front, and power all the way up to a benchmark 321 L/min (84.8 gpm) in the 8R, you can drive even the largest implements at a fuel-saving reduced rpm (227 L/min [60 gpm] at 1,500 rpm). Take-out capacity is 40 L (10.6 gal.) as standard and 90 L (23.8 gal.) with the optional auxiliary tank. Hitch controls are located in the CommandCenter™ display. Electronic sensors instantaneously relay information to the control module for fast and accurate corrections. Controls can also be accessed on the rear fender extensions. 8R Series Tractors have several PTO options available, such as the 1000/1000E PTO option, to provide the versatility and flexibility needed to satisfy all implement demands at this power level. For increased versatility, a 1000-rpm front PTO option is available from the factory for 8R Tractors equipped with the John Deere front hitch. 8R and 8RT Series Tractors offer four, five, or six rear electrohydraulic SCVs with adjustable flow rates, timed detents, and breakaway couplers. The 8R and 8RT Series Tractors feature precise control of the SCVs hydraulic flow, enabling operators to fine-tune flow rates for any application in the CommandCenter display. 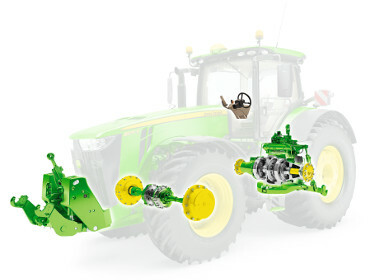 For the ultimate hydraulic output, the 8R and 8RT offer the high-flow coupler option, providing four 1.27-cm (1/2 in.) couplers and one 1.9-cm (3/4 in.) coupler, which delivers an outstanding flow rate of up to 160 L/min (42.3 gpm). 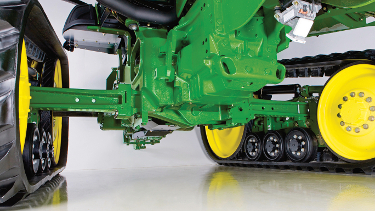 The optional front hitch offered for 8R Tractors has a maximum lift capacity at the hooks of 5200 kg (11,464 lb). One or two independent iTEC™ control capable front SCVs are available with adjustable flow rates and detent times. The front and rear hitch are iTEC compatible for total implement management. Electronic sensors relay information to the hitch control module for instantaneous and accurate corrections. The 8R offers many different hitch options to complement different application needs, all the way up to 12,124 kg (26,728.8 lb). 8R Series Tractors offer a variety of rear hitch options to complement application needs, including lower lift capacity for lighter implement applications as well as higher lift capacity for heavier implements. 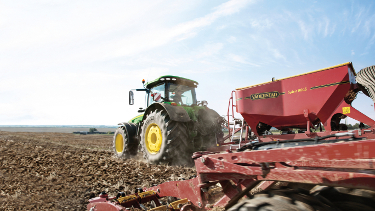 For a robust connection to pulled implements, a drawbar can be equipped on the 8R Series Tractors. An adjustable drawbar with a Category 3 pin (38 mm [1.5 in.]) fulfils the needs of most implements. The optionally available Category 4 and Category 4 heavy-duty drawbars feature a 50-mm (2-in.) pin and allow vertical loads of up to 4990 kg (11,001 lb). AutoTrac hands-free steering adds more comfort; it reliably steers your tractor from day to night and through dust or on hilly terrain. This prevents costly overlaps or gaps and enables every operator to run at peak performance. With the Generation 4 CommandCenter™ display and a StarFire™ receiver, all you need is a CommandCenter AutoTrac activation and you’re ready to start. Using AutoTrac, you can expect up to 8 percent* input savings and up to 14 percent** productivity increase. 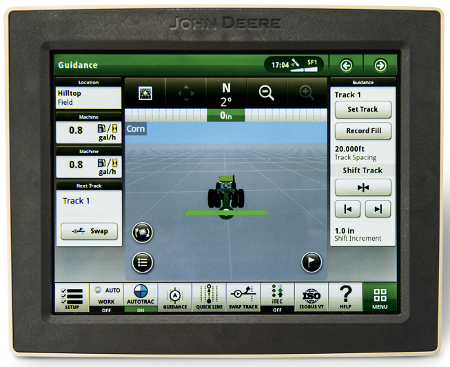 The 4200 CommandCenter Display comes in base with every 8R Tractor. The 21,3-cm (8,4-in.) touchscreen is 20 percent larger and includes one video input. Documentation, variable rate functionality, and full ISOBUS Agricultural Industry Electronics Foundation (AEF) certification come standard. Remote Display Access gets you one-click remote support and Wireless Data Transfer lets you exchange display setup and documentation data with the John Deere Operations Center. With the Gen 4 Premium activation, you can also run Section Control. The optional 4600 CommandCenter Display features a 25,4-cm (10-in.) 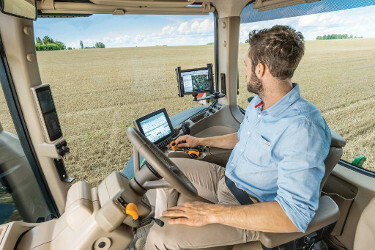 touchscreen, four video inputs, the possibility to connect to the Extended Monitor, and multiple software upgrade options for advanced precision agriculture applications bundled in the CommandCenter Premium or Ultimate Activation. 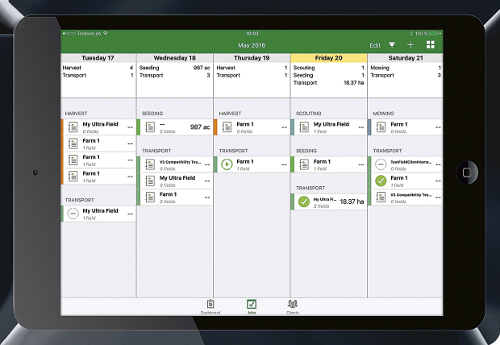 Upgrade to Section Control to minimise skips and overlaps automatically on the go. 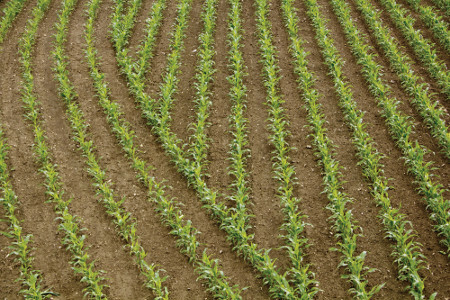 By controlling up to 255 individual sections, this saves you significant money on fertilizer, chemicals, and seed. Among other advantages, the package also includes AEF certified ISOXML (TC-GEO) documentation capabilities. The Gen 4 Ultimate Activation includes all premium features but adds even more automation capabilities on top. AutoTrac Turn Automation enables fully automated headland turns for picture-perfect headlands. 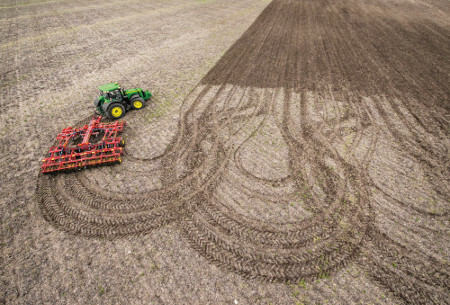 AutoTrac Implement Guidance (Passive) compensates implement drift in hilly terrain, while In-Field Data Sharing allows wireless exchange of guidance lines and coverage maps between multiple machines operating in one field. Manure is a high-quality but extremely heterogeneous fertiliser. Nutrient levels vary significantly up to factor 25 – even within one tank load. John Deere Manure Sensing enables on-the-go analysis of nutrients in manure and thereby close to the applicator. A near-infrared (NIR) sensor fitted to the slurry tanker measures nitrogen (N), phosphorus (P), potassium (K), ammonium (NH₄), and dry matter with more than 4,000 measurements per second. 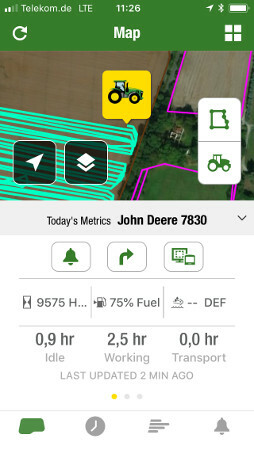 With a John Deere tractor, the sensor can directly command speed adjustments to increase or decrease application rates based on your desired nutrient target level while leveraging a prescription map. This enables you to maximise yields and meet legal requirements while cutting costs on mineral fertiliser. The Operations Center on the MyJohnDeere.com Ag web portal connects you to your machines, operators, and fields in one central location. It provides major hands-on benefits during daily operations and allows you to seamlessly exchange information with your John Deere dealer, your contractor, or other trusted partners. Connect AutoTrac™ guidance to the John Deere Operations Center and gain additional benefits free of charge. Carefully plan your jobs during the off-season to make sure that everything goes smoothly during peak season. You can easily create, edit, or delete display setup data like clients, farms, and fields, boundaries, guidance lines, or machine and implement off-sets. You not only ensure you always keep your display setup up to date and consistent, but you can also have peace of mind to always have the latest data back-up. The free MyOperations app takes remote management of your field operations and equipment to the next level. 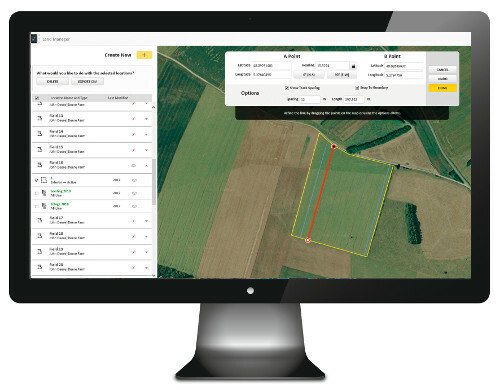 It connects with the John Deere Operations Center, empowering you to view and evaluate daily job execution, machine utilization, and field information anywhere and at any time. Eliminate paperwork and endless phone calls during job planning, execution, and reporting. With the MyJobConnect™ application, you can assign clearly defined tasks to your operators on the go, utilizing the MyJobsManager app. Your operators can view the work orders in real-time and execute accordingly on their mobile device. Once the job is done, you have instantly accurate and complete data at hand for quicker job reporting and professional invoicing.